This is a very impressive cubic, 2-storey Neo-Classic house with modillions and dentil course on the eaves. The full width verandah has a portico over the central entrance; a dentil course and a profusion of Tuscan columns reinforces the classical references. The porch has fieldstone piers turned balusters. Windows are made up of pairs or sets of three single-pane sashes. On the main storey to the left of the entrance is an angled bay and the entrance itself has double doors and transom, all with leaded art glass. Art glass also is used to the right of the entrance. On the south side the larger windows have art glass transoms and sidelights. There is a small shed-roofed single storey extension to the left side as well as a full 2-storey extension to the rear. Double bevel siding is used throughout. At the rear there is a matching many-gabled stable or service building. 1908-11: Francis William Stevenson (1881-1970) began paying taxes on this property in 1908, and improvements on the property jumped from $1500 to $6000, suggesting that the previous house had been torn down or moved. Born in Napanee, ON, Frank came to Victoria in 1890 and married Victoria-born Nellie Edna Gray (1884-1943) in 1904. They lived in this house until 1911. Frank was a stockbroker and proprietor of an investment house, F.W. Stevenson & Co, established in 1899. Stevenson held rights to a New York wire service and introduced the first stock quotations directly to Victoria via offices he owned in Tacoma, WA. When Victoria Stock Exchange was formed in 1911, he headed the syndicate. Stevenson remained active in the investment field until he was 87. In his early days he was a title-holding amateur boxer. Frank was one of Victoria’s first car drivers, and a founding member of the Pacific Club. 1912-14: John Henry Oldfield (b. Norfolk, ENG 1856-1924) had Samuel Maclure design alterations to the house, including a conservatory. John came to Canada in 1879. In Winnipeg, MB, he established a successful real estate firms, Oldfield, Kirby & Gardner. He married Emma Louise Inman (1885-1925) in 1905, came to Victoria in 1912, and settled near Elk Lake in Saanich. His son Henry Clarence Oldfield (1889-1956) lived in this house briefly. 1915-18: Sarah Eliza McLimont (c.1830-1925), the widow of William, and her daughters Christina (1858-1950) and Helena (c.1860-1936) were born in Québec City. 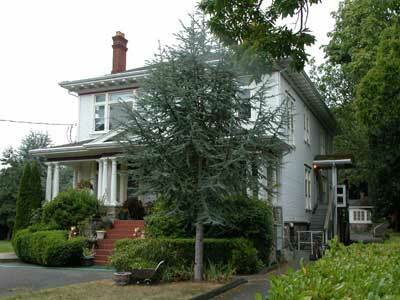 In 1914-16 and possibly later Christina paid the taxes on 1301-1311 Gladstone Av, Fernwood. 1919-43: William Lucius Morkill (b. Sherbrooke, QC 1856-1936) and Mary Josephine (née Wright, b. Newport, KY 1859-1943) married in 1888, retired to Victoria in 1919, and lived in the house until their deaths. William studied engineering in Sherbrooke and in 1885 established a successful railway business in Argentina. He went to Mexico in 1901 as manager of the British-owned Interoceanic Railroad, between Mexico City and Veracruz, later becoming manager of the Mexico-Southern. While living in Mexico they owned Casablanca, a 16th century house. William had moved to Peru by 1907, as the representative of the British syndicate that ran that country’s railroads. During WWI, he worked with the British secret service, and headed the local Red Cross branch. He was awarded Commander of the Order of the British Empire (CBE) for his efforts. He also aided French interests in Peru, and was decorated with the Legion of Honour in 1912. William was an active member of the Union Club. His nephew Alan Morkill married Nellie Mara and lived at 750 Pemberton Rd from 1927-56. William and Mary’s son Francis Edward joined the CEF for WWI in Toronto in 1914, was wounded three times, and was a Captain when he died at 26 during the Battle of the Somme in 1916. 1943-47: Retired building contractor David Arthur Chester Girvin (1882-1963) and Lucy Maude (née Bullis, 1885-1964) came from Winnipeg in 1943. 1948: Ethel Unwin (née Coughlan, b. Campbellton, PEI 1885- 1982) was the proprietor of Rockland Court, a five-suite apartment at 1503 Rockland Av (now 638 Rockland Pl). She married Walter James Unwin in Vancouver in1921. Ethel was a housekeeper when she married at 35, and worked for many years as a maid in Vancouver’s Devonshire Apartment Hotel. She was listed as head housekeeper on her death certificate. 1949-78: Robert Pellin Besant and Frances Olive (née Kirk, 1890-1978). Robert was a lieutenant-colonel in the Canadian Forces. Frances lived in the house until her death.